Ok have you ever heard of a Pop Up Party? I hadn't. Until my friends over at Flatiron 27 put this together...you've gotta check it out... With the holidays fast approaching, having a fully stocked bar is a must - particularly if you are hosting a New Years Eve party. Flatiron27 was inspired to create a sparkling-chic cocktail cart by our friend Little Miss Party and Little Miss New Years Eve in a box. 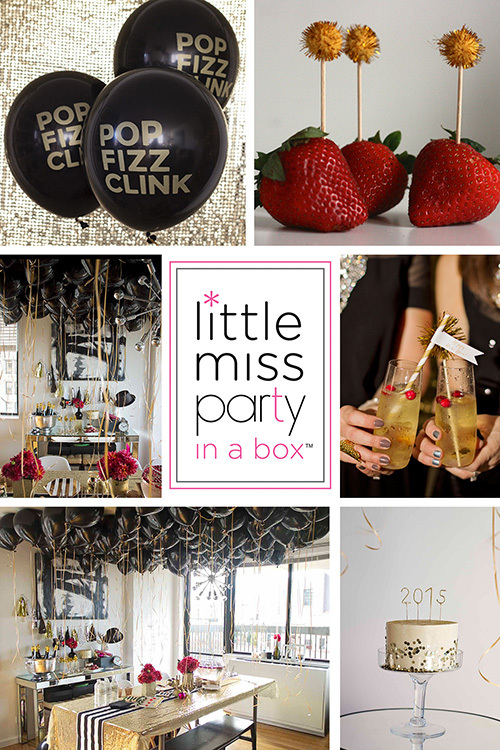 The black and gold themed party in a box couldn't make hosting a New Years party any easier - or more stylish. It comes with everything you need to host a bash - from the decorations, to the champagne flutes and party hats. All you need to buy is the champagne! We found an incredibly cool vintage Italian bar cart on 1st Dibs (here is one more option) and stocked it full of fun bar essentials including a Bauhaus cocktail shaker, Shagreen Tray and lots of metallic accents. Read on to see how we plan to decorate - and celebrate New Years in style! 1. Glass Bottles with Stoppers - West Elm | 2. Tom Dixon Eclectic Tongs - abc carpet and home | 3. Crystal Bottle Stopper - homenature | 4. Chocolate Shagreen Butler Tray - Aerin | 5. Bar Trolley - 1st Dibs | 6. Bauhaus Cocktail Shaker - Stardust Modern | 7. Lustre Bottle Opener - Kelly Wearsler | 8. Direction Bar Glasses - Crate and Barrel | 9. Resin Ice Bucket - Barneys | 10. Agate Coasters with Silver Trim - homenature.